The Good Guy toy manufacturer has been trying to cover up the incident with Chucky while simultaneously reconstructing Chucky to prove he's just a normal doll. They were wrong. Meanwhile, after his mom is placed in a mental institution, Andy is put in foster care, but the family who has taken him into their home doesn't seem to want him and all his baggage. Chucky is back and is ready to play "hide the soul." Much like the first film, "Child's Play 2" is about a murderous doll possessed by serial killer Charles Lee Ray trying to put his soul in the body of a young child named Andy so he doesn't have to stay a doll forever. Josh Lafia takes over as director for this installment, but Don Mancini does return to write another in-depth and nuanced screenplay...OK, OK, the film is about as deep as a kiddy pool and is as nuanced as a plain hamburger from McDonald's. That doesn't mean it isn't fun. Returning to the cast are Alex Vincent as Andy Barclay and Brad Dourif as voice of Chucky. New to the cast are Jenny Agutter and Gerrit Graham, who play Andy's foster parents Joanne and Phil Simpson, and Christine Elise as their older foster daughter Kyle. One may ask how a sequel to "Child's Play" got made when Chucky wound up burned and blown to bits in the original film. Clearly, they needed a plot device to set this sequel in motion, and that device is the greed of a big toy manufacturing company. This is a company so afraid of the bad press from one their dolls possibly being a murdering psychopath that they completely rebuild the doll in question to prove he wasn't a murdering psychopath, only to find out he was......oopsy daisy!! Apart from that small difference, the same story from the original Chucky applies almost beat for beat. Chucky tries to find Andy, nobody believes that Chucky is real until he comes to life right before murdering them, wash, rinse, repeat until almost everyone is killed. 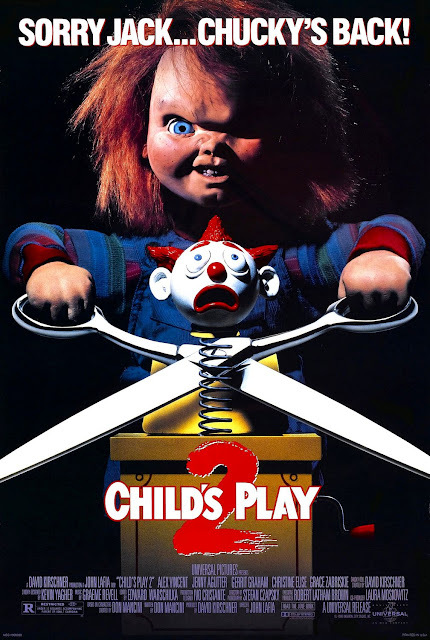 Despite being mostly a rehash of the first film, we still managed to have a decent time watching "Child's Play 2" mostly thanks to Brad Dourif's voiceover and the bits of comedy that get sprinkled into this horror flick. It really is the character of Chucky that carries these movies and makes them so much fun. For the most part, Andy simply runs around yelling about how the doll is going to kill him while everyone else is a single-dimension character who keeps insisting that Andy is just a little off his rocker. In a world full of silent lumbering slashers, the foul-mouthed, loud-mouth Chucky is always a nice, frequently funny change of pace.